With its quick printing capabilities, compact design, and wireless connectivity, the Canon i-SENSYS MF-232w is an easy choice for those who work from home, or anyone residing in a smaller office space. Efficient, and featuring an eco-friendly mode and excellent print quality, the printer has a lot going for it, although users may be frustrated by its lack of colour printing capabilities. The Canon i-SENSYS MF-232w printer has been designed with productivity and ease of use in mind, enabling users to print and scan via PC, laptop, smartphones, and tablet device – regardless of whether they’re connected directly via USB, or wirelessly. The machine weighs 10.2kg and measures 290 x 271 x 312 mm, and is Google cloud print ready, as well as being compatible with AirPrint, Canon PRINT Business App, and Android applications. In terms of task, the Canon MF-232w can handle a 100 sheet output, and has a duty cycle of 15,000 and print volume of 500-2,000 pages. It is compatible with Windows 10, MAC OS X Version 10.6 and over, and Linux. The Canon i-SENSYS MF232w I was built to be efficient and convenient; thanks to its wireless capabilities users are able to create documents, make copies, and scan directly from their PC, tablet, laptop, or smartphone. The machine can produce 23 pages per minute, boasts an easily understandable LC display, and can be used in an eco-friendly mode than automatically shuts it off once work is completed in order to reduce power consumption. 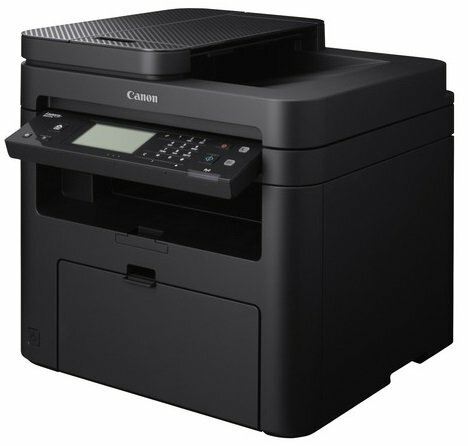 The Canon i-SENSYS MF-232w has a print quality of 1200 x 1200 dpi and resolution of 600 x 600 dpi, and is able to produce its first document from sleep mode in 6 seconds or less. Its copy capability of 9 seconds or less is equally impressive, and it can handle 999 copies at a resolution of 600 x 600 dpi. Finally, there’s the scan function, which has an enhanced resolution of 9600 x 9600 dpi, and a single-sided scan time of 3-4 seconds depending on monochrome or colour. Users will find numerous formatting and quality settings, enabling them to tailor the printer’s use to the task at hand. Although the machine is quick and efficient, and creates documents with impeccable quality, its lack of colour printing may put many users off.